This just in… I was delighted to be a guest on a recent edition of “Standing in the Sunlight,” hosted by Cynthia Rose MacCaw on OmTimes Radio. I hope you enjoy listening to our chat as much as we enjoyed having it. Here is the link. Wouldn’t it be great if life came with a map? Preferably one with clear directions on who you are and why you’re here. Imagine if that map could help you understand why things happened in your past; why things are happening in your life right now; what potential your future holds — and when it is likely to happen. Well, guess what. Life does come with a map. It’s called your horoscope. Now by “horoscope”, I do not mean those fluffy little “Sun Sign” blurbs you might read in a newspaper or gossipy magazine. 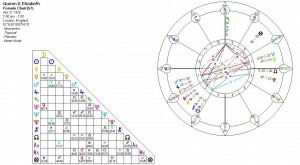 Your horoscope (birth chart) is a snapshot of the unique planetary patterns at the moment of your birth. Take a glance at Queen Elizabeth’s horoscope (pictured at right). Looks like a lot of moving parts, doesn’t it? There’s so much more than just her Sun in Taurus! And as any skilled astrologer can tell you, those patterns and cycles in her horoscope perfectly and accurately reflect her persona and events in Queen Elizabeth’s life. 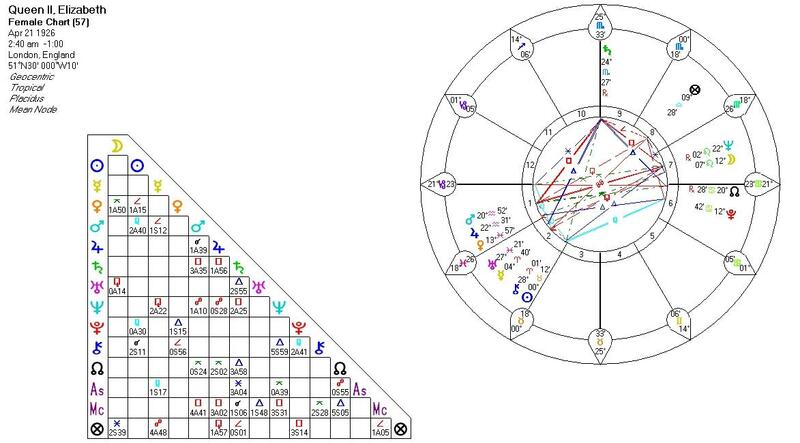 Yes, that’s right: the patterns in a horoscope correspond to patterns in life development, including, but not limited to: career, relocation, relationships, family dynamics, health concerns and much, much more. Amazing! If you are looking for clarity and direction, a consultation with a skilled and caring astrologer can help you chart your course with confidence and artful timing — synchronized with the patterns of your horoscope. To schedule a consultation that is all about you, give me a call or send me an email. I guarantee you’ll find our discussion to be practical, helpful and insightful. But don’t just take it from me. Consider the testimonials posted on these pages. Then, consider your intuition. Does it feel right? Great! I look forward to hearing from you.